Weeds are often the biggest source of ongoing upkeep in a garden, regardless of the size or type. They can grow quickly and out of control, crowding out garden plants in competition for light and nutrients. Removal is easiest when weeds are small and in moist soil when it takes little effort to grub out seedlings or pull sprouts. For winter annuals, our most common weeds, this means shortly after the first rains of the season. Delaying weed control can bring difficult problems as tap roots sink deeper, stems spread, and more seeds germinate. Physical removal—or better yet, preventing germination with a thick layer of mulch—is far preferable than applying herbicidal sprays. Chemicals such as glyphosate (marketed as Roundup) will kill weeds but leave them standing until they wither away. Non-selective chemicals also threaten to damage or kill non-target plants as well as pose an unknown danger to humans and pets. In addition, irrigating by drip systems rather than overhead watering keeps much of the garden dry and inhospitable to weed seed germination. Below are listed some of the most common weeds found in Sonoma County. Another resource to help identify weeds is the Weed Key developed by UCANR, which walks you step-by-step to identify the type of weed you're looking at. Chickweed, frequently found in gardens today, is most aggressive fall and spring months when it germinates in cool, moist soil, flowers, and easily spreads on creeping stems. Leaves are bright green, arranged opposite each other on thin and slightly hairy stems, and are broadly oval but usually less than 1 inch long. Star-shaped white flowers have five petals and 5 identical sepals and are 1/2 inch in diameter. Common Chickweed is low-growing and can form large, dense patches. It is most often found in cool, moist, shady, often compacted, fertile sites. It may persist through summer in garden spots insulated from heat and drought. To control common chickweed without chemicals, pull out foliage and roots before it spreads wider and goes to seed. English Ivy is yet another plant brought to our continent by well-meaning garden-lovers in the early days of settlement, before people understood that plants that were well-behaved in one environment could thrive so well in another that they would become invasive weeds. 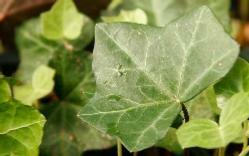 Our new article on English Ivy covers it's growth habits, problems, removal, and how to try to control it: "English Ivy." Common mallow is an aggressive weed that can grow to over 3 feet tall if allowed to mature undisturbed. It is difficult to eradicate due to its long taproot that can break off when pulled and allow growth to re-emerge even in dry soil. This mallow is identified by the nearly round corrugated leaves that vaguely resemble wheels of cheese, which also gives it the name cheese weed. Seed pods adhere along the stem as plants mature, then drop and lay dormant until soil moistens from rain or irrigation. This weed is very resistant to the herbicide glyphosate (marketed as Roundup) especially once plants mature. Control established plants by moistening soil and digging out the entire length of roots or mow repeatedly to weaken and prevent formation of seed pods. Common purslane is a thick-leaved, fleshy, summer annual that can thrive in dry, weak soils. All parts are edible and have long been eaten raw in salads, sautéed as a side dish, or added to soups. Succulent leaves have smooth margins, are alternate or opposite on stems, rounded at the tip and narrowed at the base, and vary from 1/4 to 1 1/4 inches long. Thick, round stems spread low to the ground and easily root when in contact with the soil, expanding quickly into a heavy, solid mat. Flowers are about ½ inch in diameter, yellow with five petals, and open only in sun. Tiny black seeds fall from dry capsules and may lie dormant in soil for years. Control is best achieved by pulling young plants when soil is moist. Once established, purslane develops a strong taproot and is drought tolerant. Pieces of the plant—stems or leaves—will root if left lying on the ground. Crabgrass is a low-growing summer annual that forms large round rosettes with a raised center up to 6 inches high and stems that root from the lower nodes. Clumps may reach a foot or more in diameter when mature. Large crabgrass has hairy stems and leaves; smooth crabgrass has no hairs. Older plants can exhibit reddish stems. Seeds develop on long, finger-like spikes on stem tips or side branches as weeds mature. Control crabgrass in spring by removing young plants before seeds form or alternately by applying an herbicide. In late winter (January), control by applying a pre-emergent herbicide to areas where crabgrass grew the previous season. Named for the soft prickles on stems and leaves that exude a milky sap when broken, prickly lettuce is a broadleaved winter annual or biennial that thrives in disturbed soil. An erect stalk develops a whisk-like seed head with multiple stems and small dandelion-like yellow flowers. Growth can reach 1-5 feet high and up to 2 feet wide as side stems branch and flowers develop. Seeds carried by soft, feather-like bristles float on breezes. Seeds germinate easily and plants quickly develop a deep tap root. Control before flowers set seed by pulling plants where soil is loose in garden beds. In heavy or compacted soil, the tap root is difficult to extract and must be dug out. The herbicide glyphosate (marketed as Roundup) will kill plants but should be applied only on seedlings and very young plants. Toxic and potentially deadly jimsonweed grows readily in vacant lots and along roadsides but can show up annually in gardens where it often goes unnoticed until flowers appear in summer. White or purple trumpets, 3-5 inches long, are followed by oval, spiny seed capsules resembling large burrs. Wiry, forked branches on 1- to 5-foot stems bear deep green leaves 3- to 8-inches long with irregularly toothed margins. Stems often develop deep violet hues. Although jimsonweed may appear attractive, all parts are poisonous and should be eliminated from gardens. While an herbicide can be applied as directed by the manufacturer, avoid herbicides near edible crops. Wear gloves to pull or dig out weeds before flowers and seed heads develop. Ideally, eradicate young sprouts to avoid regeneration from lower nodes of mature plants. Persistence is the key to this sometimes difficult-to-control weed. Scotch Broom is one of the many plants brought to our continent by early settlers who wanted to re-create their home environments. Unfortunately, this one reproduced uncontrollably in it's new environment and now lines some of our rural roads and frequently sprouts in our gardens. For more on the history of Scotch Broom, and how to identify and control it, continue reading here.